Football superstar Michael Vick is in big trouble for his role in a dog fighting ring. Sandra Kobrin agrees he's in the wrong, but wonders at the outrage deficit when it comes to the guys who beat their wives and girlfriends and stay in the game. National Football League superstar Michael Vick is in trouble, serious trouble. Federal prosecutors charged the Atlanta Falcons' quarterback with animal abuse for his role as the alleged leader of a dog-fighting ring and, after denying it for months, Vick pleaded guilty on Monday. He faces stiff sentencing. 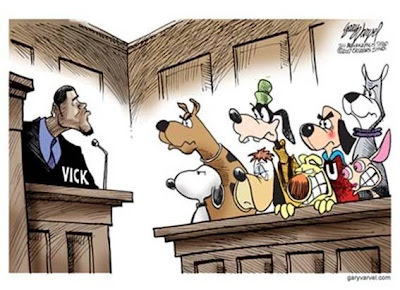 Part of it is that it's the dog days of August--the notoriously silly season for news--so the Vick story has attracted tremendous press attention. But it's been all over TV as well during the past four months, since Vick's indictment in April. PETA, People for the Ethical Treatment of Animals, which received almost $30 million in contributions last year, according to its Web site, and other animal rights organizations are demanding a boycott of companies that continue to sponsor Vick and are bombarding the NFL with letters demanding a no-tolerance policy when it comes to cruelty to animals by football players. On blogs, the outrage continues on sackvick.net and other sites, with comments like "lets give #7, 7 to life," or "lets make Michael Vick into dog food." A cottage industry of anti-Vick merchandise is out there. You can buy a chew toy for your dog in with a likeness of Vick, a "hang Vick" hat or even an eye-for-eye justice T-shirt that says "Stick Vick in the Pit." Vick has already lost most of his sponsorship deals worth millions of dollars and he deserves to lose a whole lot more. But the disproportionate punishment of Vick--while athletes who commit violence against women are let off the hook--has to be wondered at. Might it be that domestic violence and spousal abuse is so pervasive in sports that it's simply too costly for leagues to suspend so many men? What would happen after all if those poor dear teams couldn't fill their rosters? A three-year study published in 1995 by researchers at Northwestern University found that while male student-athletes are 3 percent of the population, they represent 19 percent of sexual assault perpetrators and 35 percent of domestic violence perpetrators. There are even Web site chronicles that treat the steady stream of offenders as if it were a joke. Check out badjocks.com or playersbehavingbadly.com. Maybe then again, don't. It's enough to make you sick. In April Goodell introduced a new conduct policy that stiffens penalties and holds franchises responsible when their players get into trouble. Just recently Goodell suspended the Tennessee Titans' troubled player Adam "Pacman" Jones for the 2007 season. Last summer Philadelphia Phillies' pitcher Brett Myers assaulted his wife on a public Boston street and was charged with assault and battery. Major League Baseball did not penalize him, shrugging it off as an off-field incident. Are they saying a player needs to abuse his spouse during a game to get sanctioned? If so, just how does that work? The Sacramento Kings' Ron Artest was suspended last season for 72 games for fighting in the stands. In March he was arrested for domestic violence. For that he got what amounted to a hand slap; an immediate two-game suspension and a $600 fine for a player who makes several million a year. Artest pled no contest to the domestic violence charge and was sentenced 100 hours of community service, a 10-day work project and mandated extensive counseling. The NBA did nothing here too. Maybe if he had committed the transgression on national TV--as with the fan brawl--more would have happened. Maybe if he'd hurt a dog he would have been benched for the season. Sandra Kobrin is a Los Angeles writer and columnist.